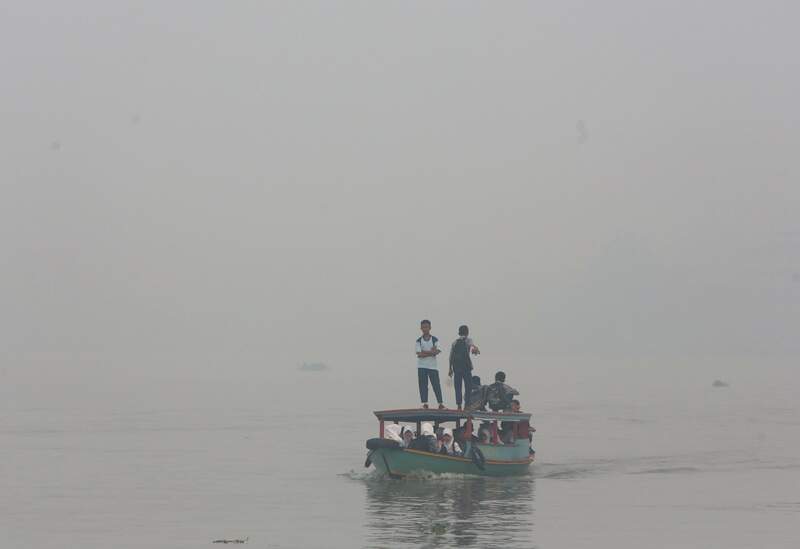 Students ride on a boat on their way to school while haze from wildfires blanket the Musi River in Palembang, South Sumatra, Indonesia. Indonesian forest fires that choked a swath of Southeast Asia with a smoky haze for weeks in 2015 may have caused more than 100,000 premature deaths, according to new research that will add to pressure on Indonesia’s government to tackle the annual crisis. JAKARTA, Indonesia – Indonesian forest fires that choked a swath of Southeast Asia with a smoky haze for weeks last year may have caused more than 100,000 deaths, according to new research that will add to pressure on Indonesia’s government to tackle the annual crisis. The study by scientists from Harvard University and Columbia University to be published in the journal Environmental Research Letters is being welcomed by other researchers and Indonesia’s medical profession as an advance in quantifying the suspected serious public health effects of the fires, which are set to clear land for agriculture and forestry. The number of deaths is an estimate derived from a complex analysis that has not yet been validated by analysis of official data on mortality. The research has implications for land-use practices and Indonesia’s vast pulp and paper industry. The researchers showed that peatlands within timber concessions, and peatlands overall, were a much bigger proportion of the fires observed by satellite than in 2006, which was another particularly bad year for haze. The researchers surmise that draining of the peatlands to prepare them for pulpwood plantations and other uses made them more vulnerable to fires. The estimate of early deaths linked to respiratory illness and other causes covers Indonesia and its neighbors Singapore and Malaysia. It dwarfs Indonesia’s official toll of 19 that included deaths from illness and the deaths of firefighters. However, the possible scale of serious health consequences was indicated by a statement from the country’s disaster management agency in October that said more than 43 million Indonesians were exposed to smoke from the fires and half a million suffered acute respiratory infections. The study considered only the health impact on adults and restricts itself to the effects of health-threatening fine particulate matter, often referred to as PM2.5, rather than all toxins that would be in the smoke from burning peatlands and forests. The bulk of the estimated deaths are in Indonesia, by far the most populous of the three countries and the country with the biggest land area affected by haze. The fires from July to October last year in southern Sumatra and the Indonesian part of Borneo were the worst since 1997 and exacerbated by El Nino dry conditions. About 261,000 hectares of land burned. Some of the fires started accidentally, but many were deliberately set by companies and villagers to clear land for plantations and agriculture. Rajasekhar Bala, an environmental engineering expert at the National University of Singapore, one of five experts who reviewed the paper for The Associated Press and were not involved in the research, said the study is preliminary and involved a “very challenging” task of analyzing the sources and spread of fine particulate matter over several countries and a lengthy time frame. Even with caveats, it should serve as a “wake-up call” for firm action in Indonesia to curb peatland and forest fires and for regional cooperation to deal with the fallout on public health, he said. Frank Murray, an associate professor of environment science at Australia’s Murdoch University, said the death estimates are not “precise health outcomes” but their overall scale should trigger intensified efforts to deal with the crisis. The study is a major contribution to addressing an international problem, he said. The study finds there is a high statistical probability that early deaths ranged between 26,300 and 174,300. Its main estimate of 100,300 deaths is the average of those two figures. It predicts 91,600 deaths in Indonesia, another 6,500 in Malaysia and 2,200 in Singapore. The researchers involved in the study say the model they developed can be combined with satellite and ground station observations to analyze the haze in close to real time. That gives it the potential to be used to direct firefighting efforts in a way that reduces the amount of illness caused, they say. The annual fires have strained relations between Indonesia and its wealthier neighbors Singapore and Malaysia, who are at the mercy of winds that carry the haze into their territory from Sumatra. But the brunt of the crisis is faced by millions of Indonesians in Sumatra and Kalimantan, many of them poor and with little or no means to protect themselves from the blanket of smoke. The Indonesian Medical Association’s West Kalimantan chapter said Indonesia faces an overall decline in the health of future generations with social and economic consequences if the situation is not tackled. Howard Frumpkin, dean of the School of Public Health at the University of Washington, said it is possible the health consequences are greater than indicated by the study because higher incidence of certain health problems in developing countries could make populations more susceptible to the effects of fine particulate matter.